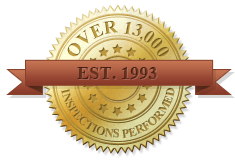 At Portland Inspections Inc., we’ve been providing our clients with the most thorough and extensive residential inspections available since 1993. We take pride in making sure our clients and realtors understand what’s involved with our inspection process, what it covers and understand the inspection results. We believe that providing you with a complete and thorough inspection is vital to helping you understand any issues the property may have, so you can make an informed decision prior to purchasing the home. Buying a home is one of the most significant purchases you’ll ever make, so having all the information you need ahead of time is crucial. Working with an experienced inspector is vital to receiving a high-quality home inspection. It takes time for an inspector to learn how to inspect a home, and each house is unique. A nineteenth century home requires a completely different inspection technique than a newer home built in the 2000’s. We’ve had over 25 years of experience inspecting a wide variety of homes and can tackle any inspection with the confidence that we know exactly what to look for. We know that home inspections can be difficult to understand, which is why we provide an hour at the end of the inspection to walk you through the results. We’ll take you through a client walk-through, where we show you the concerns we came across in the house. We’ll point out problem areas, explain maintenance and energy specifics and answer any questions you may have. The Most Comprehensive Report In Portland. Click here for a sample.